My NEW comes out next week. Watch the video to see a sneak peek of this fun drawing book for the video gamer and artist in your life. 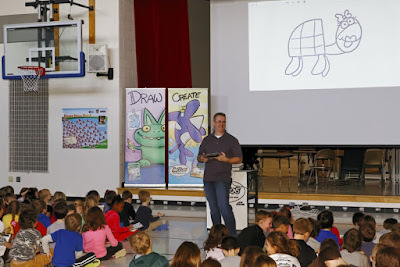 Hello drawing fans, Steve Harpster here and I do school visits where I teach kids how to draw, create and imagine. I have been visiting school and drawing with young artists how to draw for a good number of years. My programs are fun, easy to run, and best of all, affordable. Want to learn how your school can have a Harptoons drawing presentation? Just go to the SCHOOL VISIT section of my website and fill out the school visit form and you will be taken to the School Visit Information page. I hope to draw with your students real soon. How I draw. Speed art with commentary. Here is a fun video where I show the tools and process I use to create an illustration in my sketchbook. I hope you can use these techniques and ideas for your illustrations. Creating how to draw videos on the road isn't very easy, but I am trying my best to keep on drawing and sharing my love of drawing with everyone out there. So have fun drawing this Alien using the number 15. I hope you have fun drawing this crazy looking dog. I think it looks like a pug but my seven year old disagrees with me. Not sure what to do with all those fidget spinners? Did you know you can draw a really amazing Mickey Mouse using a fidget spinner? Fidget spinners can be used to draw almost perfect circles. So enjoy this video while spinning your fidget and then try drawing your very own Mickey Mouse. Hey Drawing Fans! What a busy school year it has been. I visited 93 schools this year from Ohio to Texas. Every school was awesome and I had a great time drawing with all my young artist friends. I also say Disney's "Guardians of the Galaxy," last week and it was an excellent flick. Baby Groot stole the show and was a fun character to watch and "root" for (get it? root for.) So enjoy this video and check back soon for more awesome drawing vids. Every school I visit this year requests a drawing tutorial for a megalodon. If you're not sure what one is watch this video and see one for yourself. Here is a fun video that I came up with a while ago and just couldn't wait to share it with the drawing public. In this video I take the number 17 and turn it into a leprechaun. I also used my new Mevo camera to film this video. I like the fun camera movement it does, but I still need to get used to some of the settings...a few times the camera was focused on some odd things and caught me off guard. This week I decided I came up with the idea on how to draw King Kong. It was a last minute idea that I had to see happen...so I started filming right after one of my school visits. After a school visit I am really tired, but I really liked this idea and with the new film of King Kong coming out this week it was the perfect fit. Hello drawing fans! I took sometime off in January to get things organized and ready for a NEW year of Harptoons how to draw videos. This is the first video for 2017! I have another Valentines Day video coming out next week too and if you like drawing with hearts check out harptoons.com for more drawing with heart videos. Santa Claus is coming to town! Here is a fun video where you and your kids can learn how to draw Santa. SO a NEW Star Wars is going to be out every December from now till the end of time...and I love it. So here is a fun way to draw a cute little wookie. Hey, Inktober has started and it's a great daily challenge for artists to create art daily and share it with the world. Anyone can do this, this is a challenge for anyone that enjoys drawing and creating art. The only rule (as I understand it) is you need to ink the art. That means you can use a sharpie, a pen, a quill pen...any kind of ink you like. Hey there drawing fans, I am really excited about this video because it has my new intro video. Learning to make You Tube videos isn't easy, but I love making videos. I love trying to make them better each time too. I always wanted to redo the intro and make it a bit more fun and manic also. I think I achieved that? I am releasing all my books as digital downloads in my Harptoons Store. I was getting many requests from people in other countries where shipping is too expensive. So I am working over the next few weeks to make all my books available for digital download. It's time for another year of school visits! Yes, I actually go to schools and draw with 200 - 400 kids all at one time. The school visits are really fun and it's amazing to be in gymnasium with 400 kids all silently drawing and working inside the creative space of their heads. Kids love to draw, but don't always know what to draw or feel confident enough to start a drawing. I show them how to turn letters and numbers into really amazing characters and the kids love it. Want to find out how to book a Harptoons school visit? Just click on this LINK to find out more info. Hey there drawing fans, I am happy to announce that there will be three NEW Harptoons drawing books out this fall. Here is the first one Drawing Super Cute Baby Animals Using Lowercase Letters. I am really excited about this book and the characters really are cute. I will have more info on how to order this book and the release date soon. Here's another fun video for you to draw from. This is a very easy character to draw and lots of fun too. Here is an easy way to draw a bald eagle starting with the letter "Z." When I came up with this idea for this drawing I was on my way home from vacation and doodling in my sketchbook. I take my sketchbook everywhere just for times like this. You just never know when an idea might hit. Learn how to draw this funny person with the letter "J." 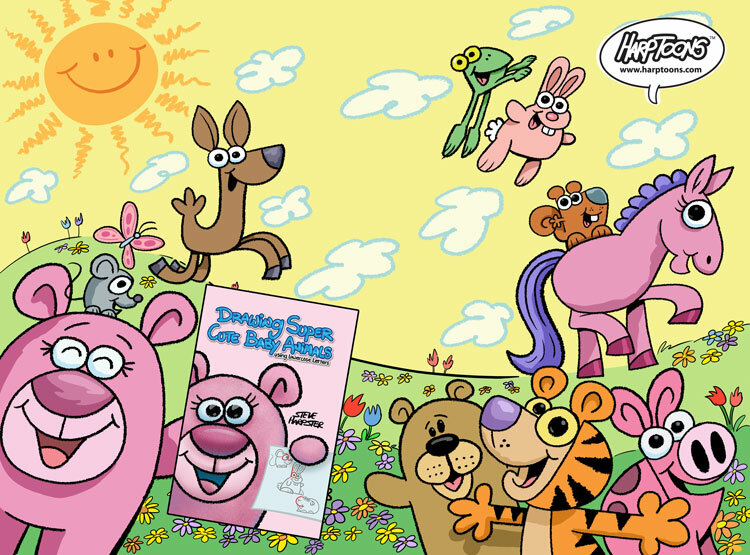 This video is from my book Draw Crazy Cartoons With Letters which you can purchase at Harptoons.com or on my Shopify store here [Link]. I added the Pokemon beast just for fun since Pokemon go is all the rage right now. Hello drawing fans! Here is a fun way to draw a sloth starting with the number 10. Just want you to know that my summer library visits are almost over. There are just a few left and you can find out where and when they are on the home page of Harptoons.com. You can find many new dragons in my reprint of the book Drawing Dragons With Numbers. Here is one of them, the Twin Headed Dragon. Pretty cool looking beast if you ask me. Check out the Harptoons store if you want to purchase your copy of this fun drawing book. Watch me draw some fun pics on the Wii U using the app Pixel Maker. Hey drawing fans, I am doing drawing programs this summer at many libraries around Ohio. These events are FREE and everyone gets to draw with me. Below is a list of all my summer drawing presentations. I hope to see you at one of these events. Check out this funny video and learn how-to-draw and elephant riding a skateboard. I have so much fun creating these videos. I really hope you enjoy watching them! Wow, what a year. I am scheduled (as of this day) to do over 96 school visits. That's a whloe bunch of schools. I have been to several sates this year. Texas, Illinois, Indiana, Ohio, Kentucky and soon Michigan. The response at every school is always great. Teachers had no idea how much kids love to draw! Now teachers are incorporating drawing into their own classroom lessons. I even have some lesson plans on my website that teachers can use for FREE. You can check the out here LINK.